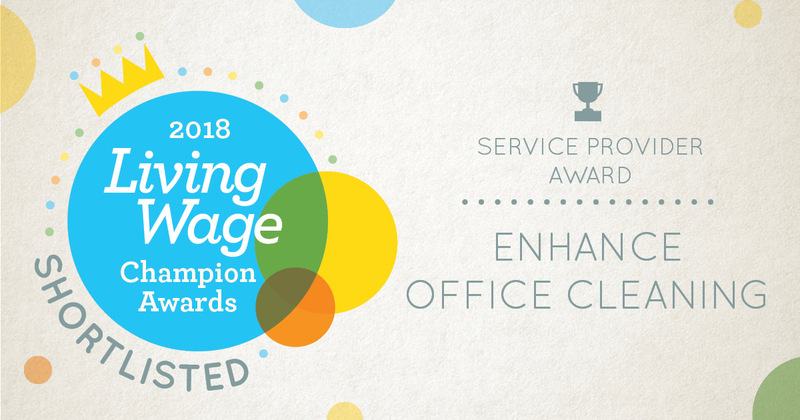 Enhance has been shortlisted by the Living Wage Foundation for the Living Wage Champion Awards 2018. The awards recognise Living Wage employers and individuals that have made great contributions to communities and industries by implementing and celebrating the Living Wage. �Enhance have actively promoted the London Living Wage since 2010. We know that clients paying this rate directly benefit from lower absence, higher work standards and the fact that their company is directly helping to improve the lives of everyone who works for them. These days� companies are increasingly being judged by their corporate social responsibility (CSR). Switching to the London Living Wage is an easy and quick method of demonstrating a firm�s commitment to CSR, whilst simultaneously improving the quality of service and value for money offered by their cleaning staff�. The Living Wage is an hourly pay rate set independently, updated annually, and calculated according to the basic cost of living. Employers choose to pay the Living Wage on a voluntary basis, and almost 4,000 accredited employers have now committed to put respect and dignity at the heart of their organisations by paying the Living Wage. The awards are judged by an independent panel of business and community leaders, and winners will be announced in June.